The sight of the red Kovala flowers that float on the Neyyar river as a ruby red carpet made this fishing village in Thiruvananthapuram to be known as Poovar, literally meaning "Stream of Flowers". 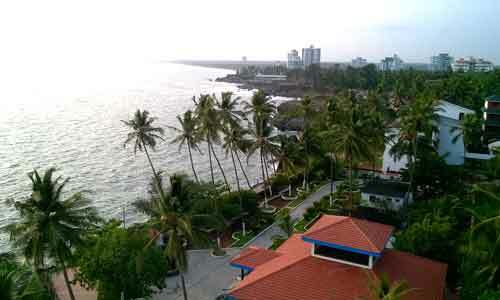 It is an unexplored, yet a spectacular and picturesque island surrounded by sea, river, lake and backwaters. It is such a sought-after eco-tourism destination blessed with serene environment, pleasing climate, extraordinary beaches, blue lagoons, and the queue of banana and coconut groves in the backdrop. Poovar is a blissfully isolated paradise, perfect for a hassle-free holiday. You can relax, rejuvenate, meditate, do yoga and cherish the exotic beauty of this tranquil island. The backwaters of Poovar is a home to a variety of water birds like Indian Cormorant eagle, Black Darter, Brahminy Kite, Sea Egret, Kingfisher, and Night Heron. If birdwatching excites you, Poovar offers you the opportunity to watch birds. The Poovar Beach is the major haunt of the pleasure seekers. It is quite a breathtaking beach that separates the river from the sea. You can engage in beach sports like volleyball and football on this beach. The centuries-old martial arts village is a place worth for a visit. Backwater cruise is the main activity in Poovar. Speedboats and wooden motor boats are provided to cruise along the backwaters of Poovar. Pay a visit to Poovar and have a splashing holiday at its sparkling beach. Spend a day at the picture-perfect Poovar Beach. Go for a boat ride across the Poovar Backwaters. Immerse your soul in the breathtaking beauty of the Thirparappu Falls. Engage yourself in the watersport activities at the Kovalam Beach. Discover the hidden beauty of Aazhimala. Explore the natural seaport, Vizhinjam. Carry sunscreen lotions, sunglasses and camera. Avoid visiting Poovar during monsoon reason because of heavy rainfall. There will be a lot of walking and hiking around Poovar. So, don't forget to carry a pair of sports shoe with you. August to March is the best time to visit Poovar. Summer (March-May) is extremely hot with temperature ranging from 28°C to 37°C. Winter (November - February) is very pleasing making it the ideal season for sightseeing. Nature blesses Poovar with heavy showers during the monsoon months of June to October. Rainfall is very often during this season making it uncomfortable for sightseeing. By Air : Trivandrum International Airport is 28.1 Km away. By Train : Parassala Railway Station is 11 km away. By Road : Neyyattinkara KSRTC Bus Station is 10.9 Km away. You can shop wooden sculptures and brass sculptures from Kairali Handicrafts. Silk and cotton handlooms and textiles can be purchased from Aswathy Textiles. You can get a wide collection of branded clothes from Village Shopy. You can buy local crafts and other products from Poovar Market.